The one thing that seemed pretty strange to me when I walked around Lucknow is that none of the heritage monuments I saw were palaces. 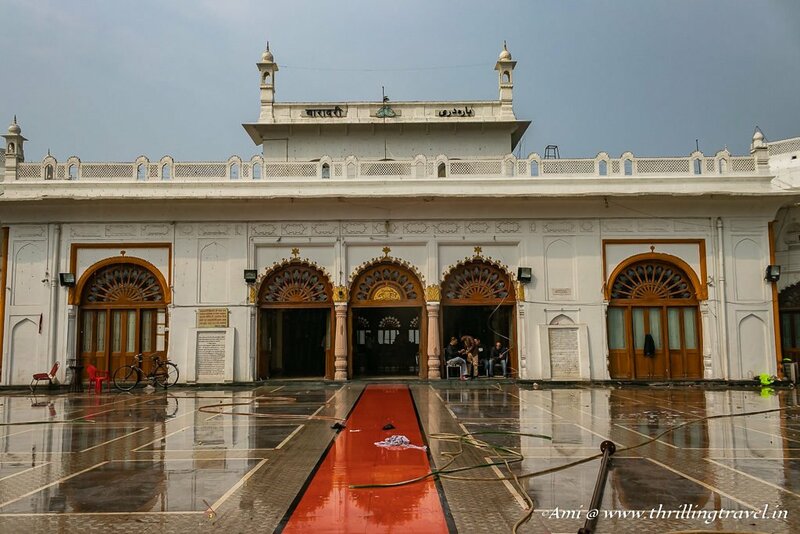 Given the grand structures like the Bara Imambara, Rumi Darwaza and Chota Imambara, I expected to stumble upon the majestic residences of the Nawab. However, as fate be, almost all of them were destroyed. I longed to see at least some remnants and Tornos India rewarded me with a heritage walk along the Kaiserbagh Palace. 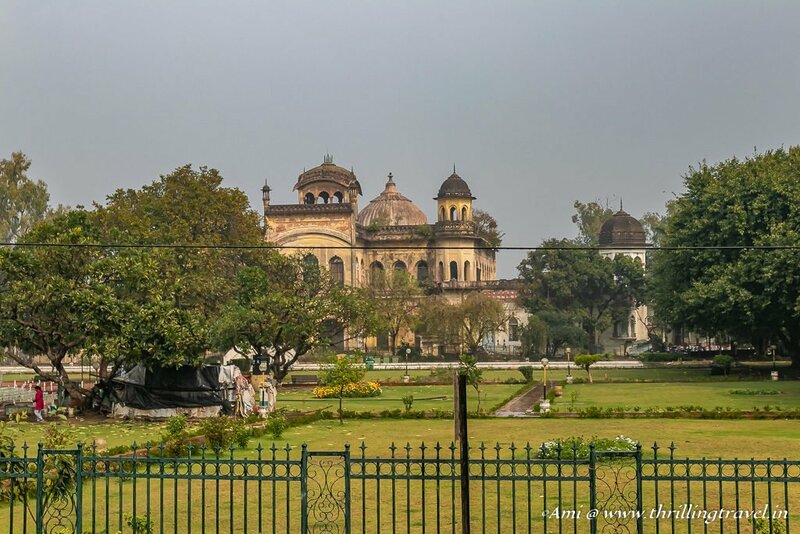 Kaiserbagh or Qaiserbagh was considered to be the most beautiful of all the Awadh palaces. 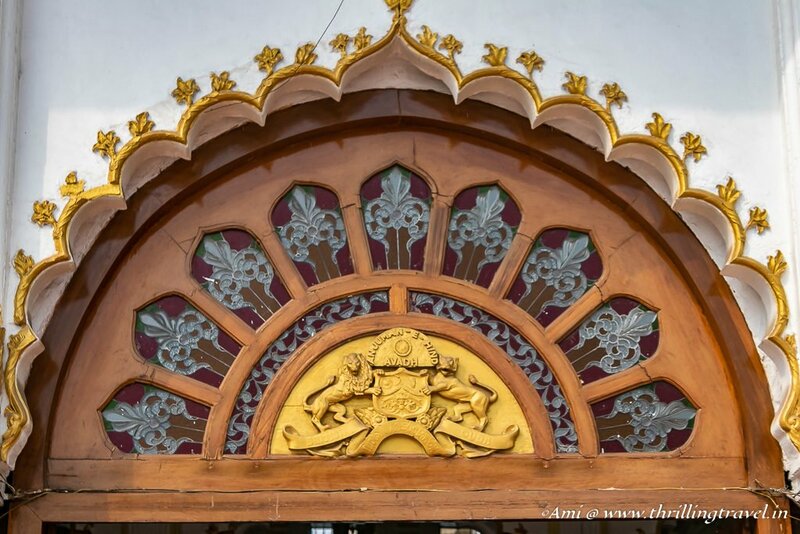 It was a multi-structured complex – complete with bustling bazaars, mosques, the Nawab’s durbar, his residence and his Zenana. You can only see it in pictures now for it was razed to ground post the 1857 siege. Or maybe – not all. 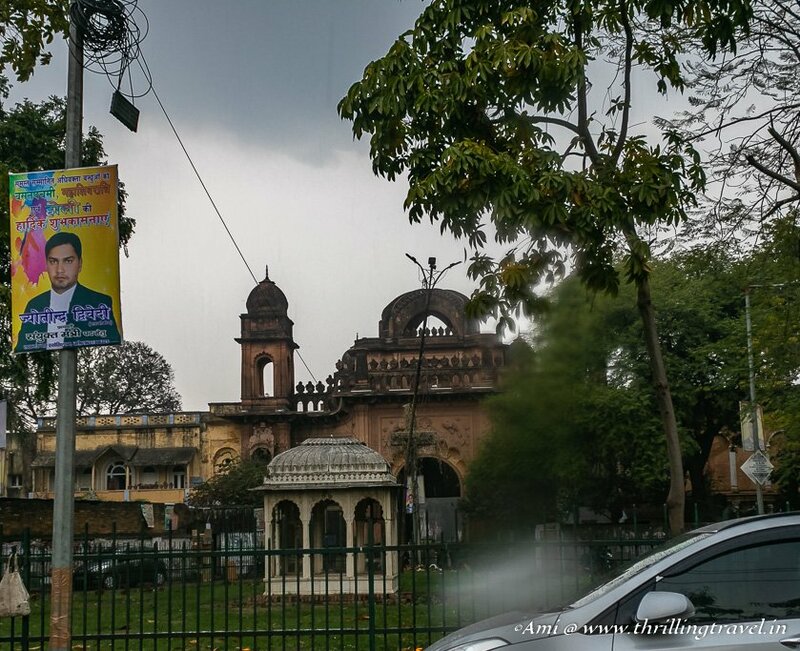 A few remnants are still hidden in the present-day Kaiserbagh area of Lucknow. It was Tornos who helped me piece these hidden relics and reconstruct the entire layout of Kaiserbagh. Best you relive that through this heritage walk of mine. 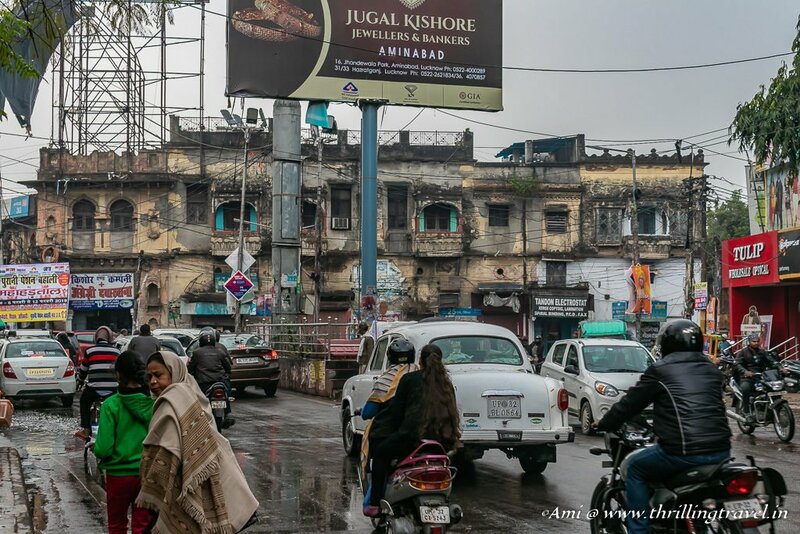 I am pretty sure that by the end of it all, you will be adding Kaiserbagh to your list of places to see in Lucknow. 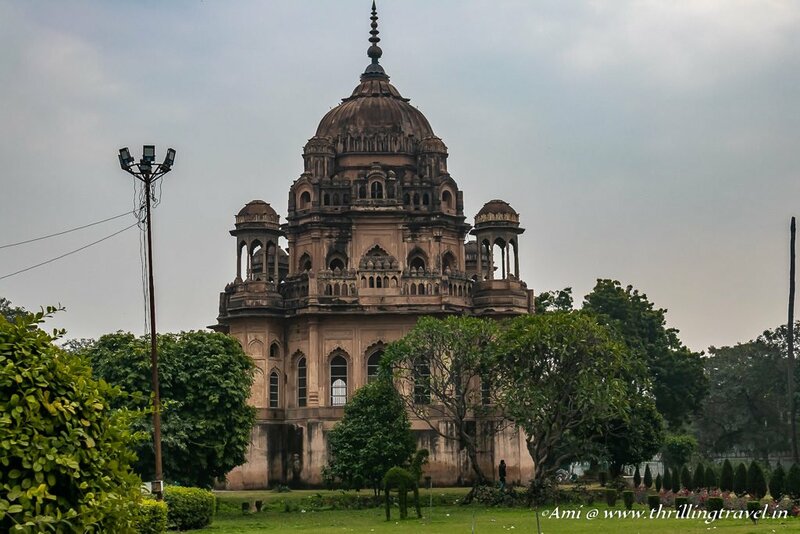 Kaiserbagh was the 4th and the final palace of the Nawabs who ruled Lucknow. 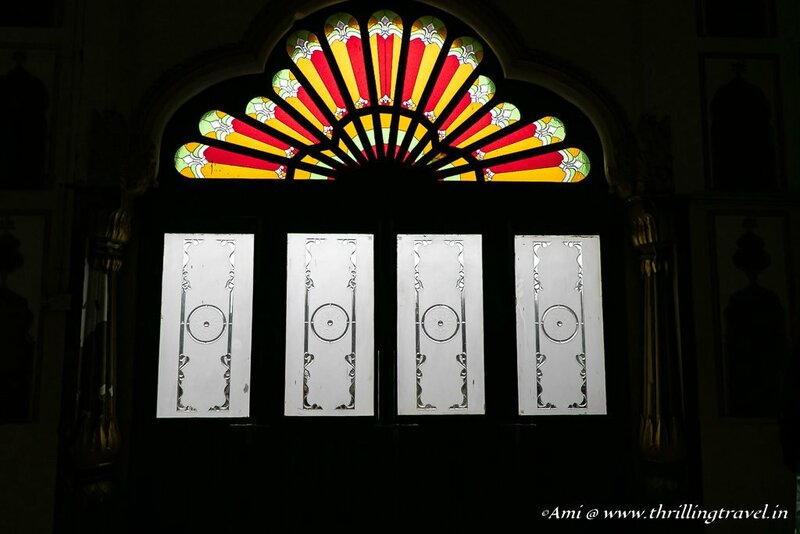 The first one was called Macchi Bhawan, the 2nd being the Daulat Khana and the third being the Chattar Manzil. It was in the year 1847 during the rule of the last Nawab of Lucknow – Wajid Ali Shah, that Kaiserbagh palace was built. The palace remained as a stronghold even after Nawab Wajid Ali Shah was exiled to Calcutta. In fact, it became a powerhouse for the revolt of 1857 with the wife of the Nawab – Begum Hazrat Mahal taking charge. Unfortunately, after the debacle, the British felt that the walled city could pose a threat to their rule and decreed that the same be destroyed. And thus, came down the magnificent structure. Before we dwell further on what Kaiserbagh really looked like, I think it is important that you know the creator of this imperial monument. 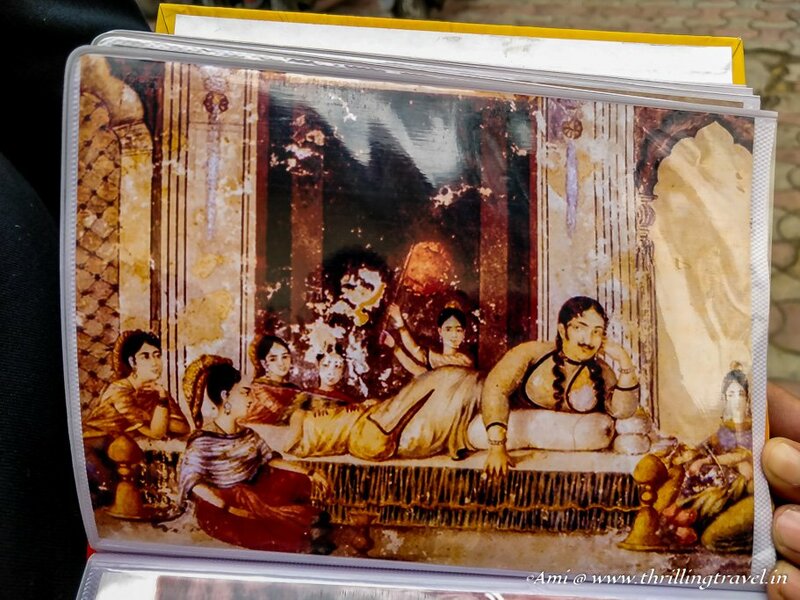 You are likely to appreciate your heritage trail better when you understand Nawab Wajid Ali Shah for his personality that emanates from in his creation. For those of you who are familiar with Hindustani Classical Music or Dance like Kathak, the name Nawab Wajid Ali Shah would definitely be ringing bells. This Nawab of Lucknow was a true patron of arts. He was the one responsible for creating and promoting the famous Lucknow Gharana of Kathak. The Nawab himself, received training in Kathak under Bindadin Maharaj and was famous for his own compositions of Thumris that are still used in this form of dance. Music governed his life so much that he named people and his army units in the most musical manner. For example, he called his young dancers – Pari (Fairy) while some of his army units were named Ghanghur (Dark) and Akhtari (Lucky). He extended his musical notes to various corners of his palace – such as – a park called Sawaan Bhadon (Monsoon showers) where he had swings installed to enjoy the delights of rains. While the Nawab was not known as an ambitious ruler, he was famed to be quite benevolent. It is widely believed that Lucknow was the most beautiful during his reign and its people quite happy. He was discredited by the British with his extreme passion for music. They deemed him as incapable of a rule and deported him out of Lucknow, appointing another as their puppet Nawab. 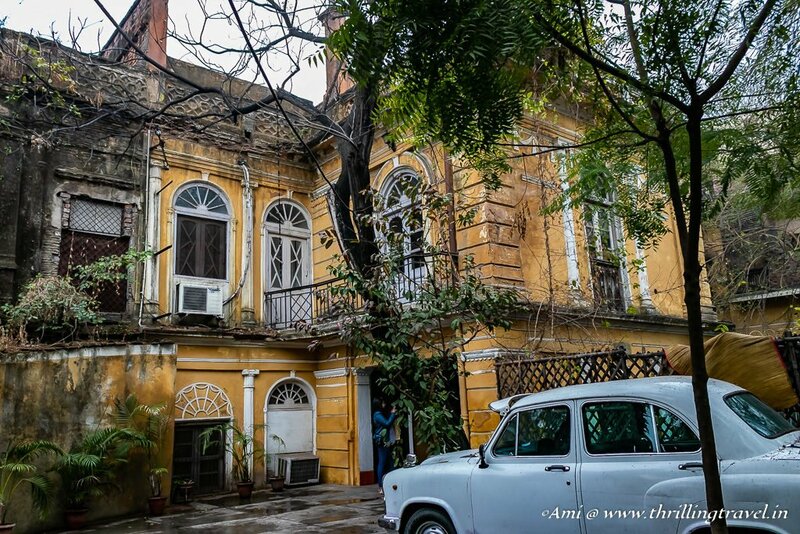 The Nawab moved out to Metiabruz in Kolkatta and was given a generous pension. He used that to create his mini Lucknow there till he died. The only way that you can see Kaiserbagh in its complete state is with this picture. Nawab Wajid Ali Shah designed it to resemble his vision of a Paradise. Since most of his key buildings were red, he called it Kaiserbagh – Kaiser meaning Saffron and Bagh for Garden. He modeled this on the Persian gardens of Char Bagh. This kind of layout has a central structure that can be approached from four different directions. Quite like some of the Mughal monuments that you can still see. Humayun’s tomb is a perfect example of this. Did you know that the Humayun’s Tomb in Delhi was called a Garden of Tombs? Discover why through this post on the lovely UNESCO World Heritage Site. 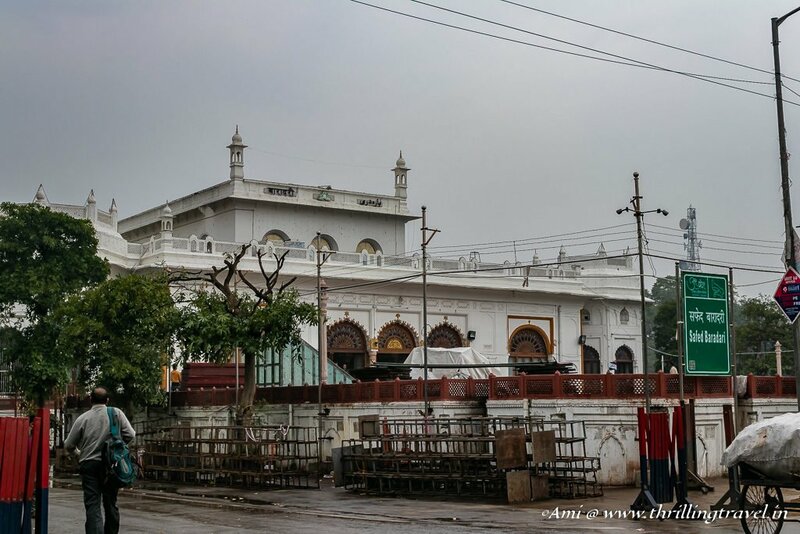 Kaiserbagh had three distinct sections – the outermost that consisted of public areas like a Meena Bazaar, mosques and halls where the Nawab addressed the public. The 2nd section was the residential palace of the Nawab himself which even included his office, the treasury, hammams and his private mosque. The last section was that of the Zenana or the ladies area which only the King and select people were allowed to visit. Our Kaiserbagh heritage trail started in Hazratganj at what is currently, the Uttar Pradesh Press Club. It is here that the first grand gate to Kaiserbagh existed. The British tore it down to create an office for themselves which later became the Press Club. It is said that once you entered the old gate, a bazaar called the China Bazaar used to greet you. The market was flooded with goods made in China and hence the name. The outer gate was supposed to be tall enough for elephants to enter. Beyond this gate was one more gate called the Mermaid gate. The name was owing to mermaid sculptures on the gate. 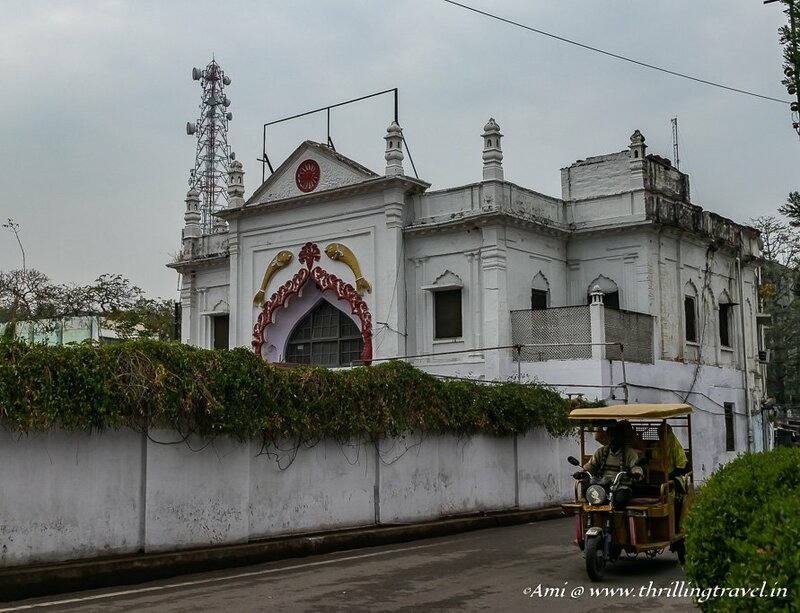 The prime minister to the Nawab is said to stay close to this gate which led to the private gardens of the Nawab and ultimately, to his residence. However, none of these stands erect anymore. 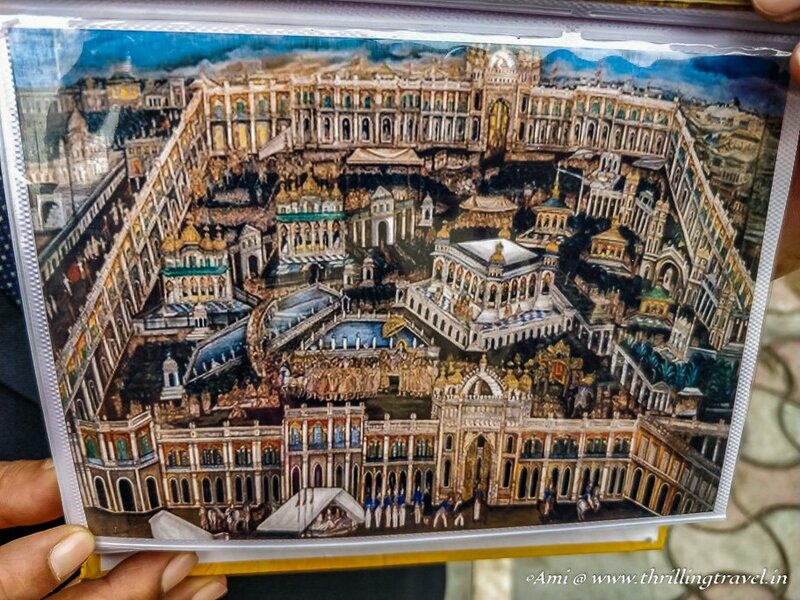 Our guide – painted a lovely picture of this entire layout that allowed me to paint a picture of what might have been. As we continued toward a majestic looking tomb, he pointed out to one of the other gates to Kaiserbagh. 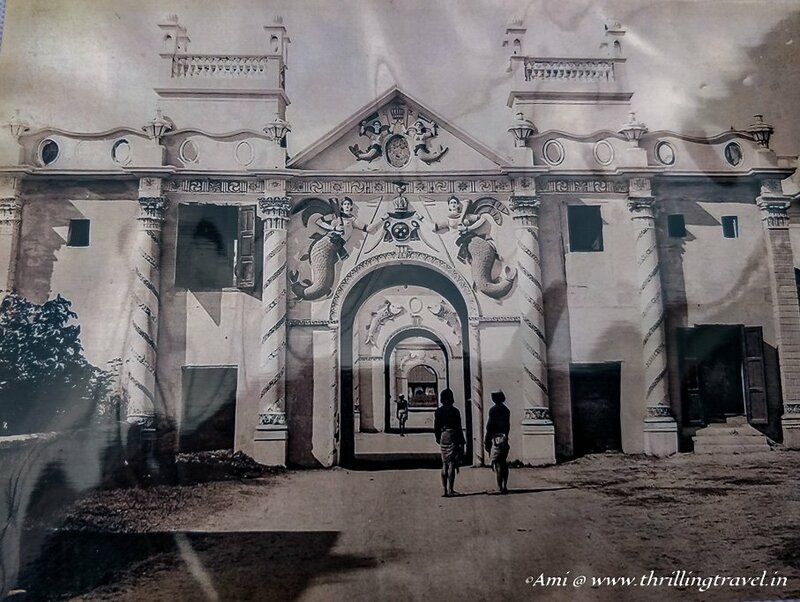 This was the 2nd gate after the main entrance behind the old palace of Chattar Manzil. 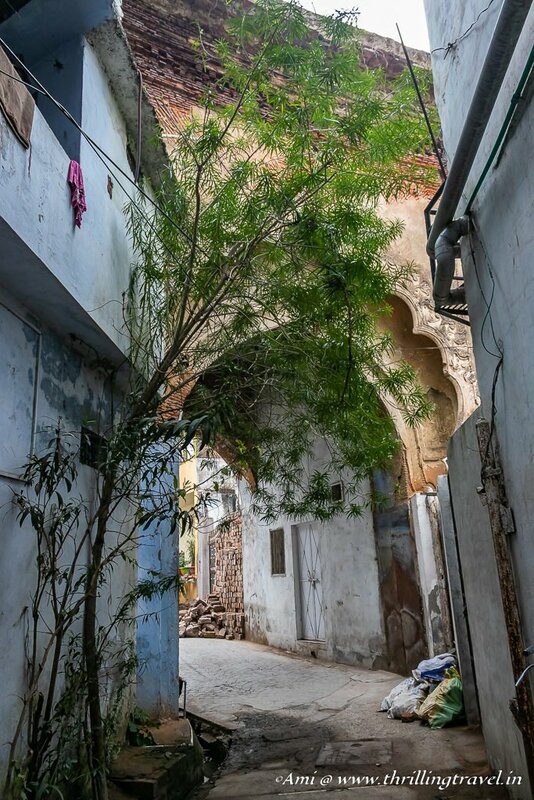 The gate used to be called Sher Darwaza but was renamed Neil’s gate after a British officer with the same name died here during the 1857 revolt. Neil’s gate was primarily used by the women to enter the Zenana area. I found my attention wavering when our guide shared the information about Neil’s gate. It wasn’t that it was any less interesting. It was just that the sights opposite to the gate kept drawing me towards it. Two stunning tombs stood erect in this area which had many such glorious structures earlier. These were the Maqbaras or tombs of Nawab Saadat Ali Khan of the Chattar Manzil fame and his wife Murshid Begum. The tomb was built much before the Kaiserbagh palace by the son of Nawab Saadat Ali Khan. He, in fact, got the same erected in place of his own palace where he was crowned. Built in a typical Awadhi style. this tomb had walls made of Lakhori bricks and Limestone. Its multiple minarets and domes gave it a very palatial feel. I could see that there were balconies and terraces which promised a great view. However, for that day, it was out of bounds. The high ceilings within the tomb had intricate motifs painted on them while the floor resembled a chess board. There was a perfunctory tomb – a small depression in the floor of the main hall for the actual one which lay in the basement. This was the tomb of the Nawab himself. The actual grave of the Nawab is below the place marked here. The two side rooms of this main hall had three tombs each. They say that one set belong to his wives while the other three were for his daughters. There was very little to see within but I sure longed to explore the outside from the terrace. Maybe I will go back just for that. This might be smaller than her husband’s tomb but was no less impressive. However, I could only admire it from the outside for the place was locked. 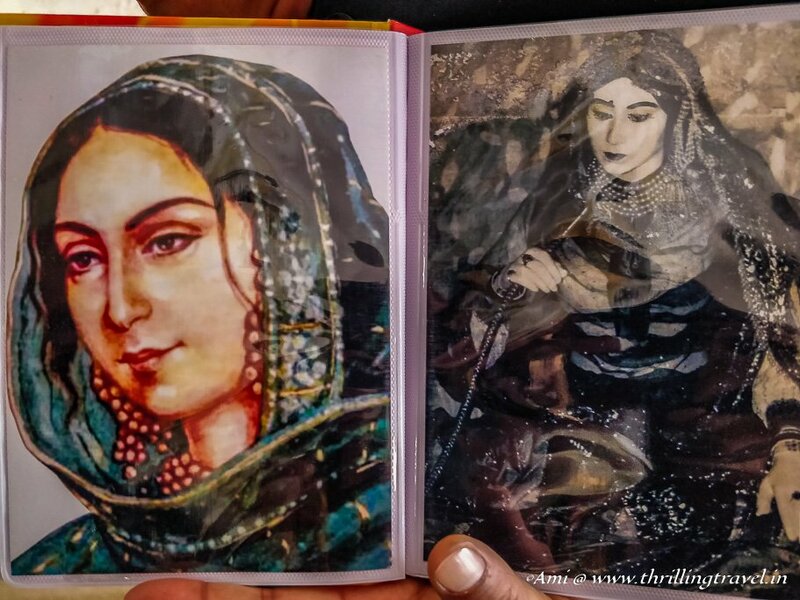 They say that Khushidzadi or Murshidzadi Begum lay in peace with her daughter in the underground vault. 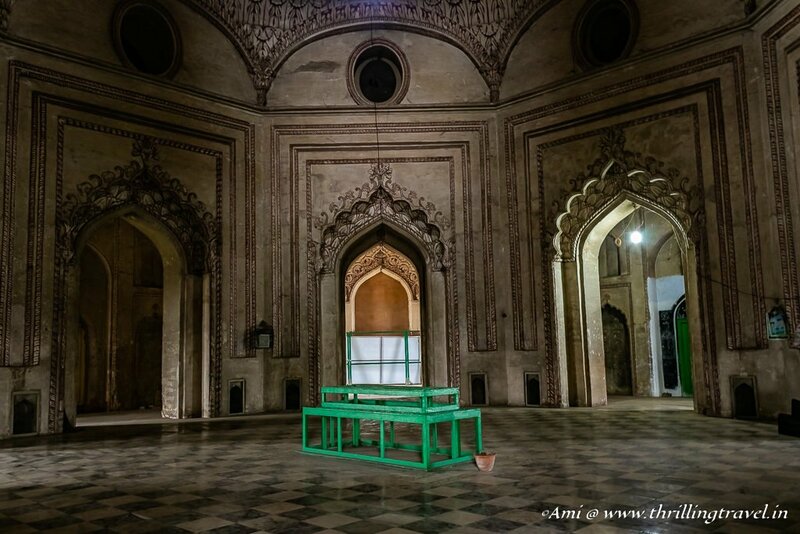 Again, this beautiful tomb was built by her son – Nawab Ghazi ud-din Haider – who built the other tomb. Thankfully, these tombs were left undisturbed by the British who razed down every other big building of Kaiserbagh and its surrounding area. Our guide took us past the tombs across a street and turned to a corner. 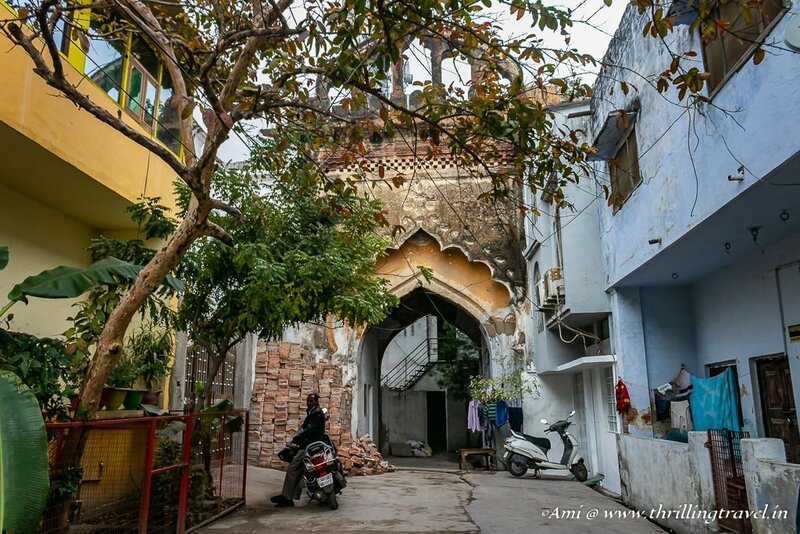 Hidden behind the modern buildings, shrouded by overgrown trees was one lone gate from the era of Kaiserbagh. A nondescript sign in Hindi labelled this as the Gol Darwaza – one of the smaller gates to the Zenana area of the palace. This is where some of the Paris stayed. Gol Gate from the other side. The old homes were more or less destroyed but a few structures that remained were seamlessly integrated into the present structures. One could identify the old structures owing to the Lakhori brick and limestone structure. 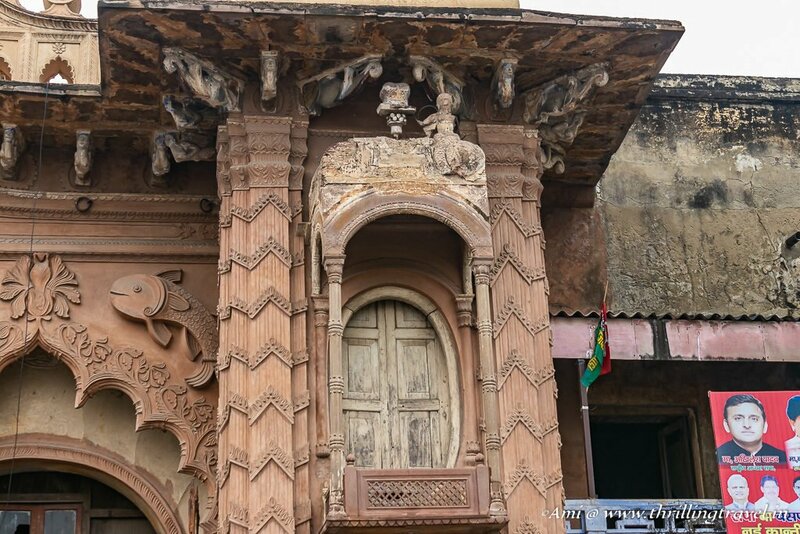 In this case, our guide pointed to a sculpture of Ganesha over an old window. Possibly the lady who stayed here was a Hindu. You have been hearing about this Pari business since I started this post. I briefly mentioned that the Nawab called his trainee dancers Pari. However, before we go further, let me share some more details about his Paris and the rest of Zenana. Nawab’s Zenana consisted of three major types of women. 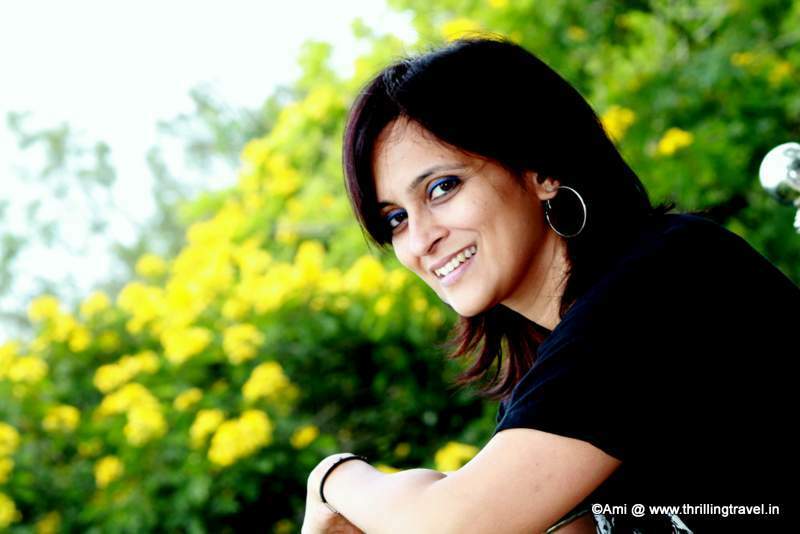 The first was Pari – who were little girls that showed a promise in dance. The Nawab used to get them to his court and make them a part of his Zenana. They were given training by the best dance masters in Kathak. 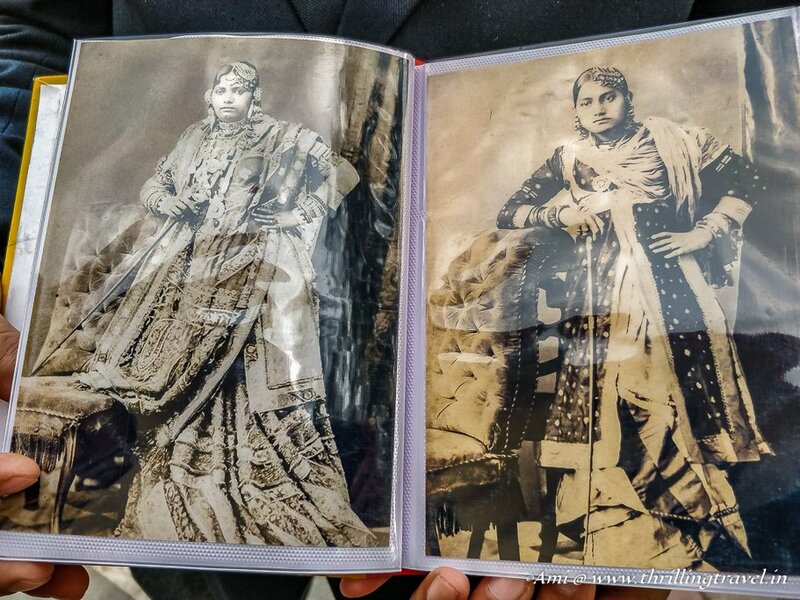 Of these, some of the pretty and graceful ones that caught the eye of the Nawab were made into Begums – which formed the next level of women. Begums became the concubines of the Nawab. They were given a different set of residence – a little more luxurious than the Paris who almost lived in a dorm kind of a setup. They dressed a little more lavishly compared to the Paris. From these Begums, a few entered a contractual marriage with the Nawab and they became the Queens or Mahals. 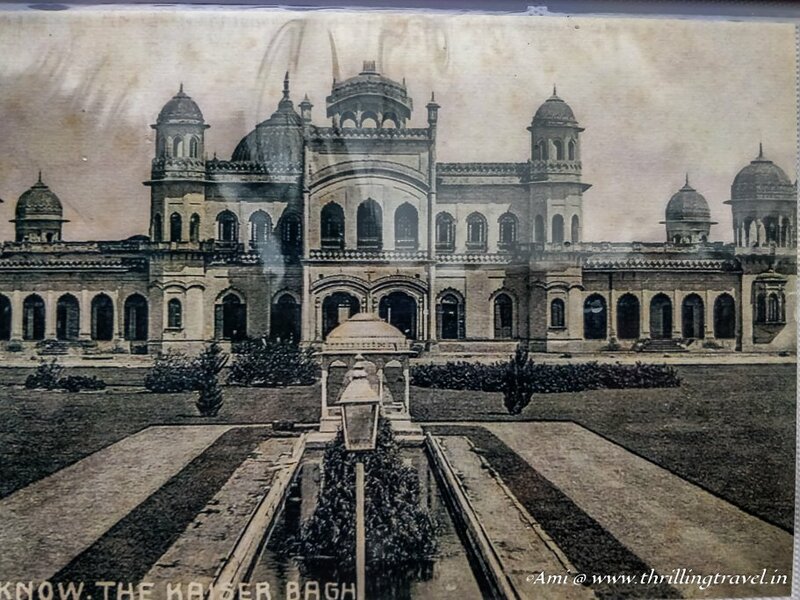 Mahals had their own luxurious palace and bore legal heirs for the Nawab. Begum Hazrat Mahal was one of the main Mahal of Nawab Wajid Ali Shah. She rose from her stance as a Pari to that of a Mahal. 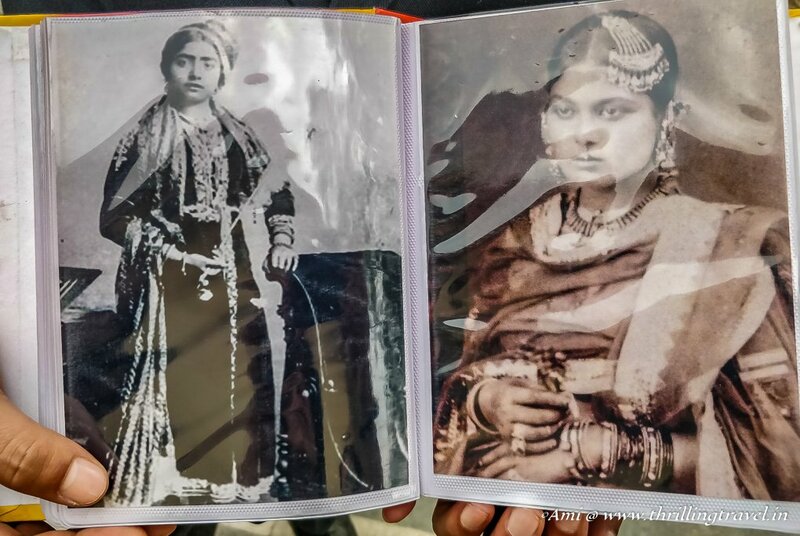 She is credited for carrying on the fight for Kaiserbagh even after her husband was ousted out of Lucknow. This is the reason why she has her own identity – other than being a Mahal of a Nawab. Exiting the narrow lane, we turned back towards the lone tombs to reach a grand building in the corner. This is one of the sole remnants of the Kaiserbagh palace – the Pari Khana. This building was the training center for the Paris. When the British started destroying the Qaiserbagh area, this particular structure was left alone and converted by a British officer – John Lawrence, to a music college. Later one part of this place was converted to the famous Bhatkhande School of Music while the other hosted the State Folk Art Museum. 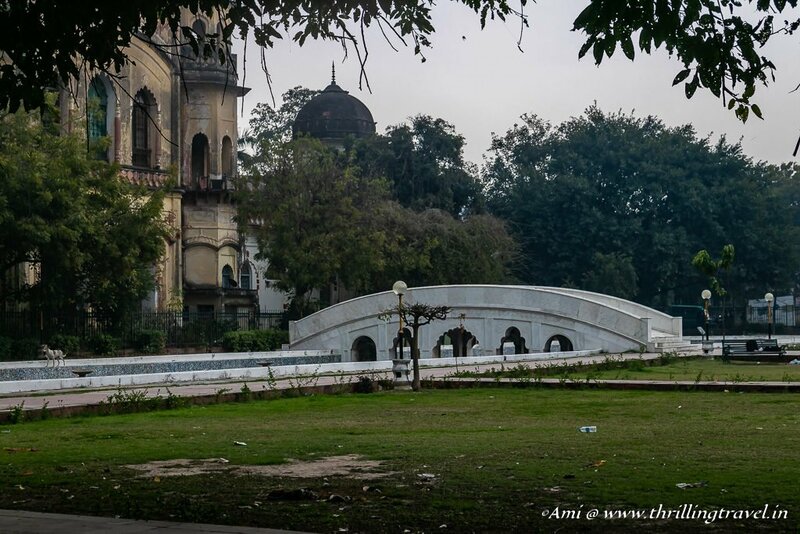 The Pari Khana and its surrounding gardens along with its marble bridge called Sangmarmar Pul is one original part of the Kaiserbagh layout. There were fountains , flowers and trees that made the whole set up quite divine. Using this bridge, the Paris used to cross over to what was called the Safed Baradari. We continued to walk along the edge of the Pari Khana gardens as our guide showed us a few more remains of the Kaisarbagh Complex. 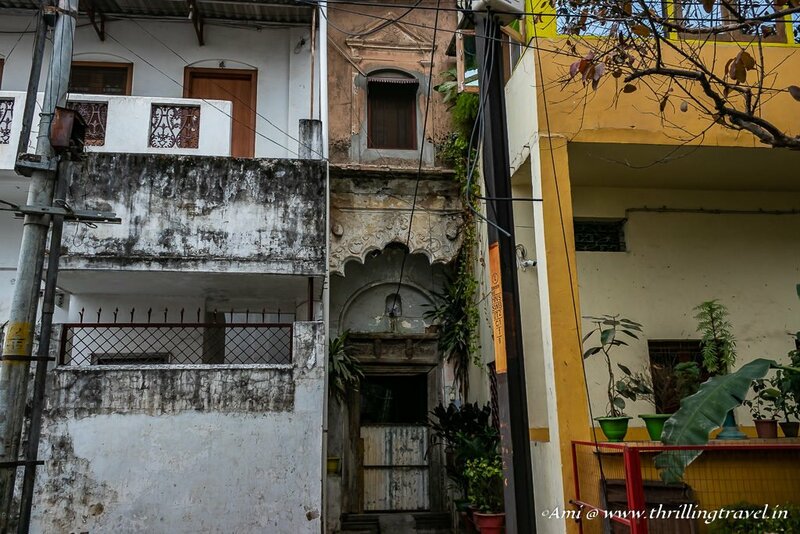 On the opposite end of the street that we walked on was a large mansion that is said to belong to the Barber of Nawab. 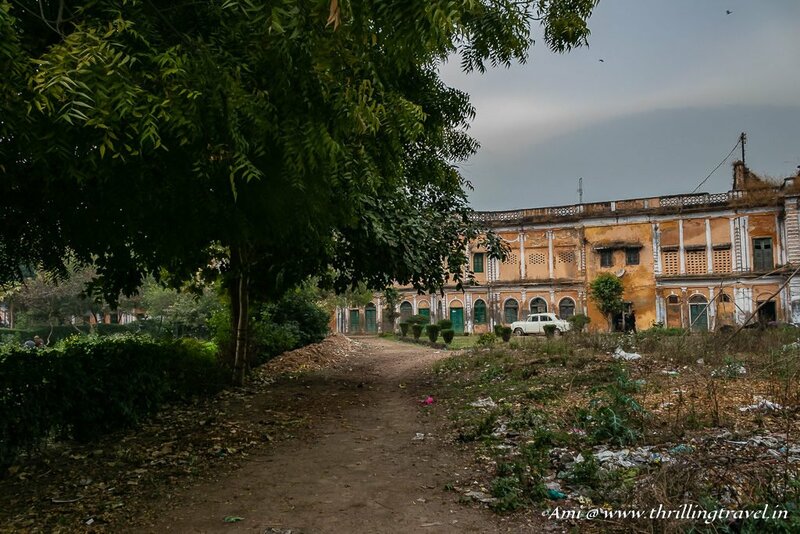 It is said that the Nawab annexed the place to include it into Kaiserbagh. Next to the mansion was what they called the Chaulakhi gate – because it cost char or four lakhs to build. At the end of the road, we reached this white building with beautiful colored glass windows. 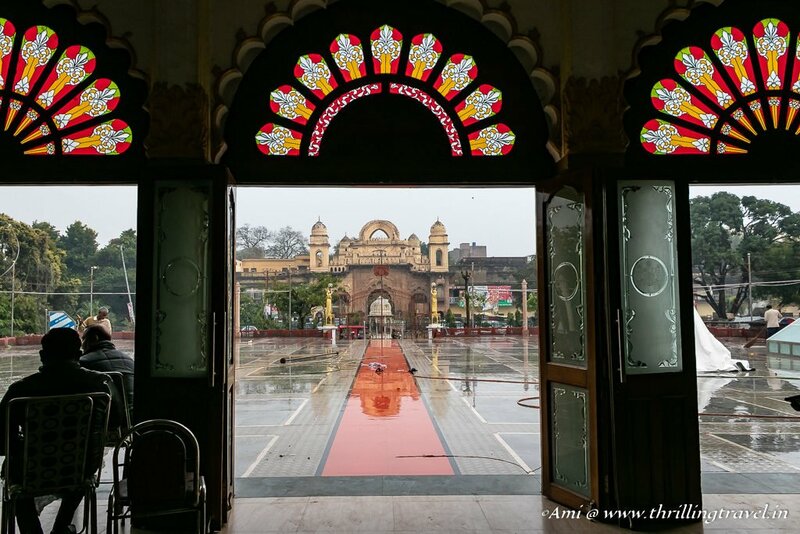 Called the White court or Safed Baradari, this turned out to be a perfect haven for us – given that Lucknow skies burst open for some unseasonal showers. It also, gave me a perfect chance to admire the large hall with stained glass windows. 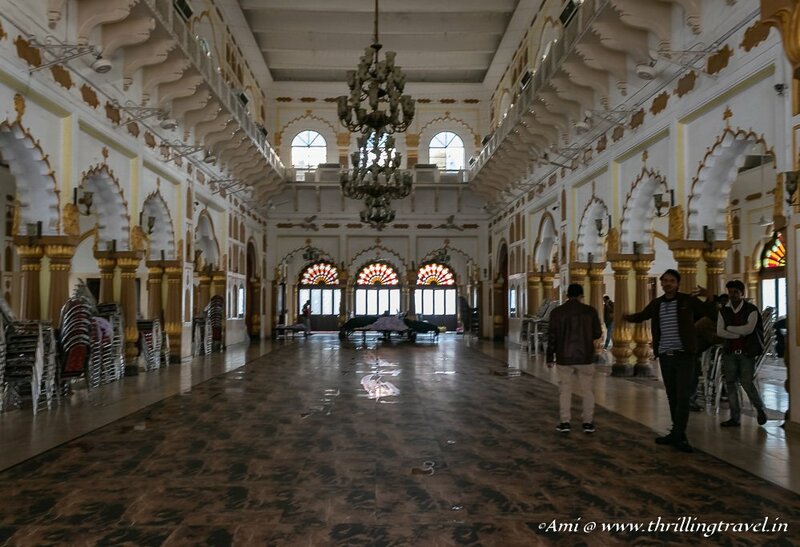 This used to be a hall of mourning for the Nawab. He used it to hold prayers for Muharrum quite like the other Imambaras in Lucknow. Later the British converted it as a place for meetings and petitions. Today the hall has been converted to a community center that is let out for important weddings and other celebrations. A few of the original fittings have been restored – such as this crest of Awadh empire. Standing along one of its doors that faced the Pari Khana, I could well imagine how the Paris paraded into the Baradari which incidentally, was sometime used for Nawab’s performances. 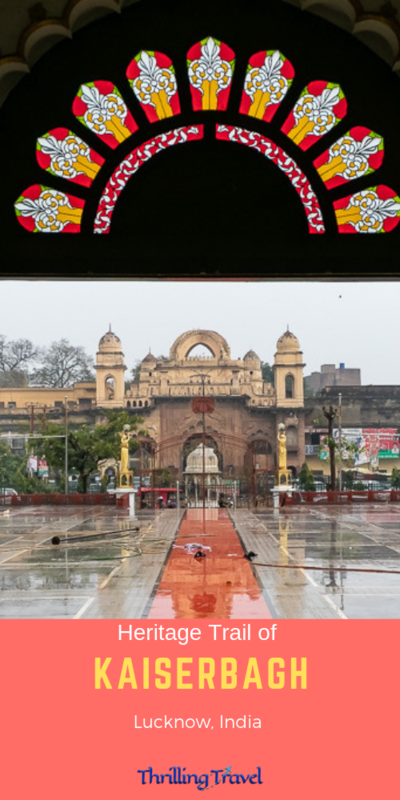 Mercifully, the rains stopped within minutes and we crossed over to a gate that was diametrically opposite to the Chowlakhi gate that we had seen earlier. 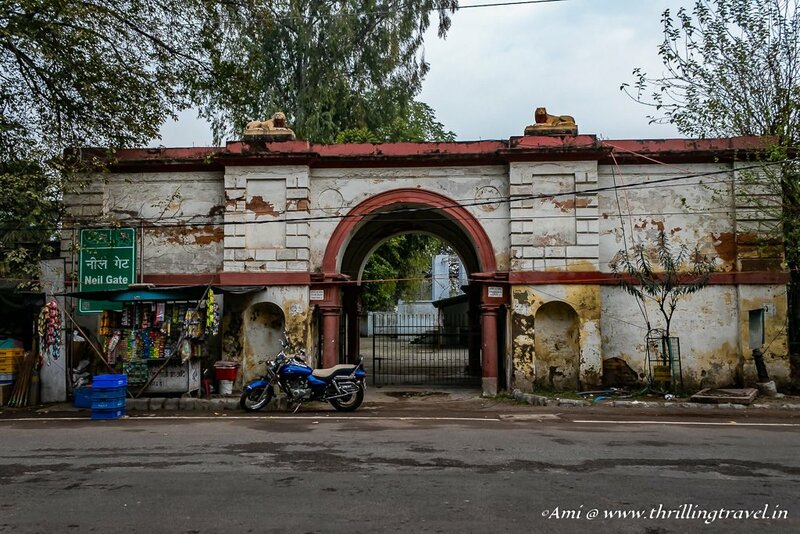 This was called the Lakhi gate gate and was one of the key entrances to Kaiserbagh. The gate was made for one lakh Rupees and hence, got its name. It is between this gate and the Press club gate that the China bazaar was spread out. Though the Lakhi Gate was grand with its double sheltered arches, to me, it fell short of the immense beauty of the Rumi Darwaza in Old Lucknow. I suppose, that since it was not the main gate from the outside, it was a little less grand. 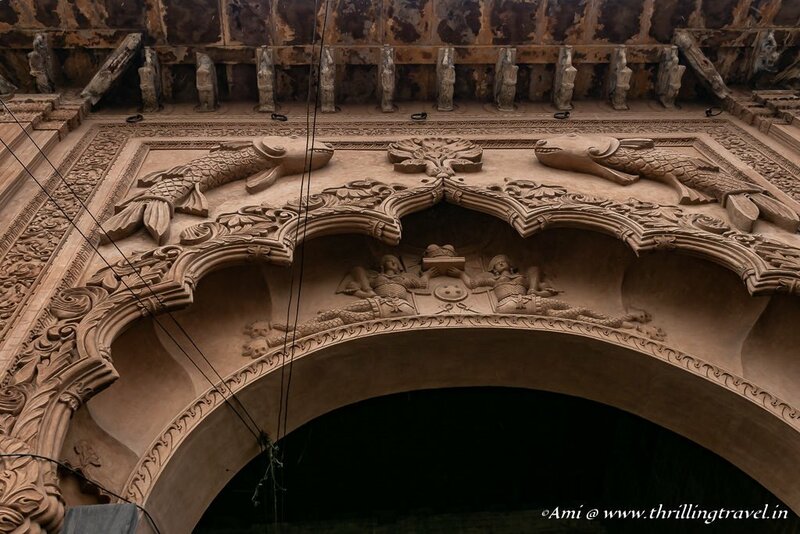 The most prominent thing about this gate is the two fish carvings and in the inner arch, the two mermaids. Even the inner brackets are carved like the Mermaids. Fish were the royal symbol of the Nawabs – something that you will see in any of the old monuments of Lucknow – like the Bara Imambara. However, the Nawab being his poetic self, changed this legendary symbol to mermaids. Now there is an interesting saying about this. Since the Nawab fiddled with the good luck of fish, he is said to have had bad luck that caused him to lose his empire. 😉 With that nugget of information, we turned to our last destination on this walk, leaving the busy Lakhi bridge behind. We had almost reached the Qaiserbagh circle for our last stop when our guide pointed out to two important relics from the palace days. 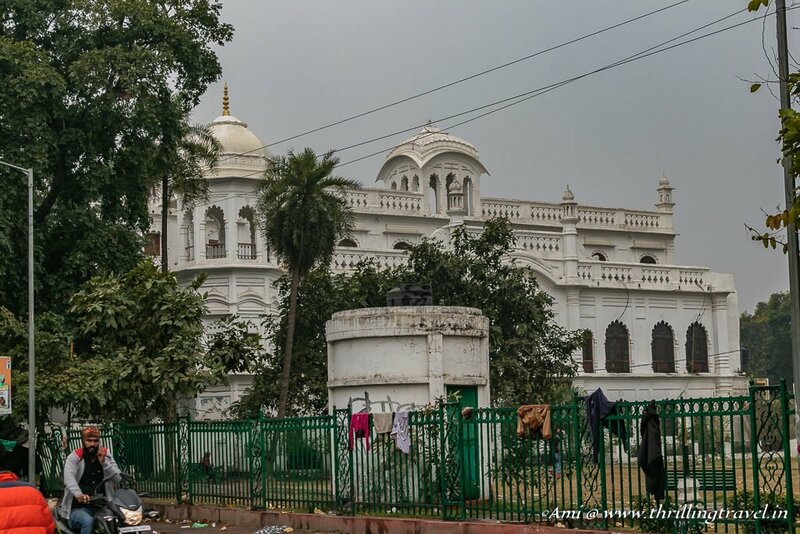 The first was a library called Amin-ud-daulah. This used to be a huge stage with 8 water pillars. In those days, it was called Lanka. It was a tented pavilion used for performance and was so named as it was surrounded by water – just like the Island Sri Lanka. 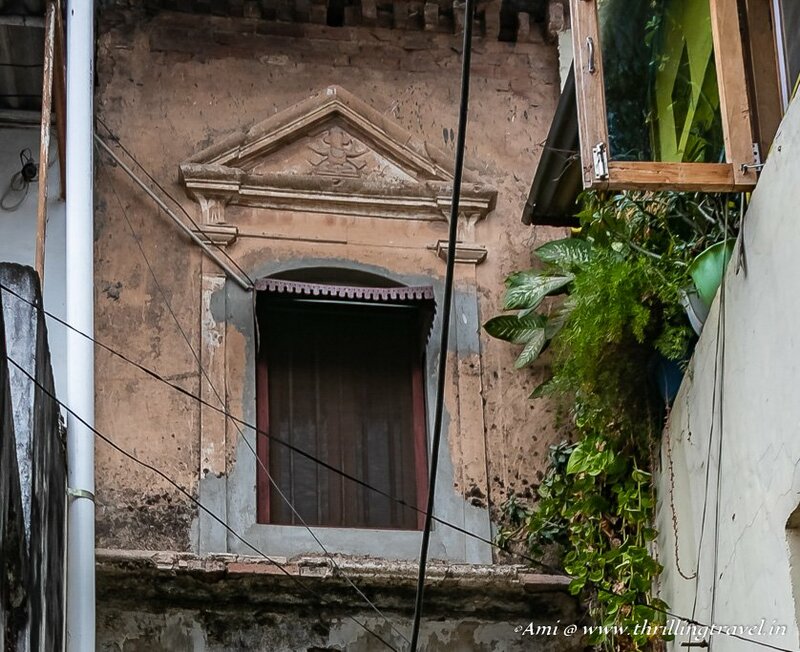 The 2nd thing that the guide showed us were the old Lakhori buildings where various prostitutes resided. One could still see the old windows where they possibly called out to their men! This is where we made a turn to an elegant bungalow. 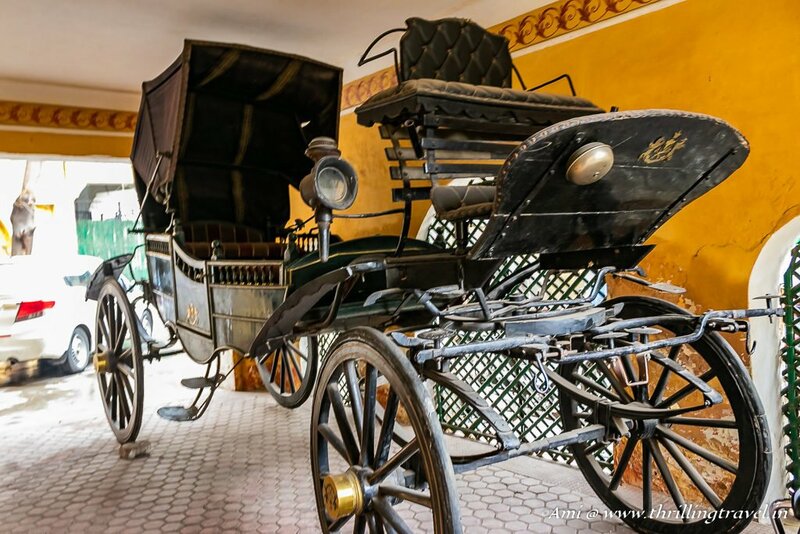 The House of Kotwara was an old colonial styled mansion with a Buggy in front. This was where the Raja of Kotwara state resided. Once the British had destroyed Lucknow, they split Awadh into different states to have a better control over them. Kotwara was one such state and its Raja was given a pension to live on. 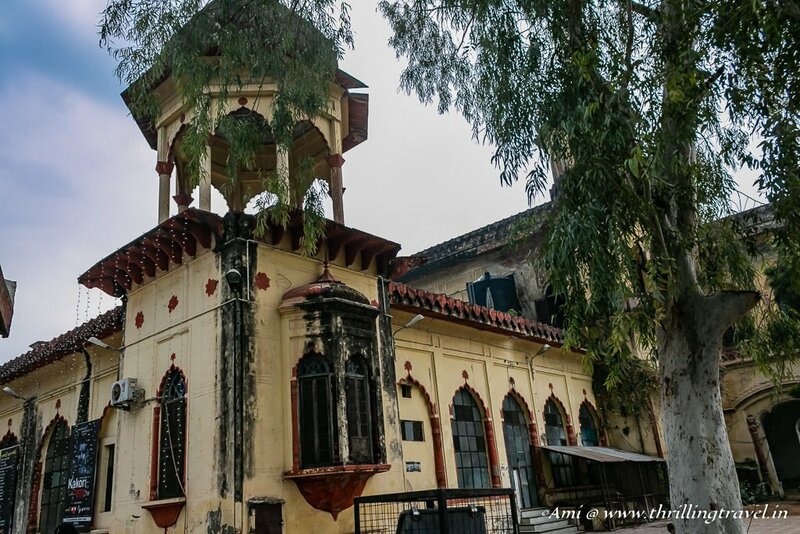 This Bungalow was still owned by the descendants of this Kotwara family – who incidentally is none other than the famous filmmaker of Umrao Jaan fame – Muzaffar Ali. It is here that we concluded our walk with some tea and biscuits served in a Royal manner. The Kotwara House has been restored to its original state by its owners. The entire house and its rooms showcase the royal living during the British era. It is in no way close to the Kaiser Bagh era but is interesting nonetheless. 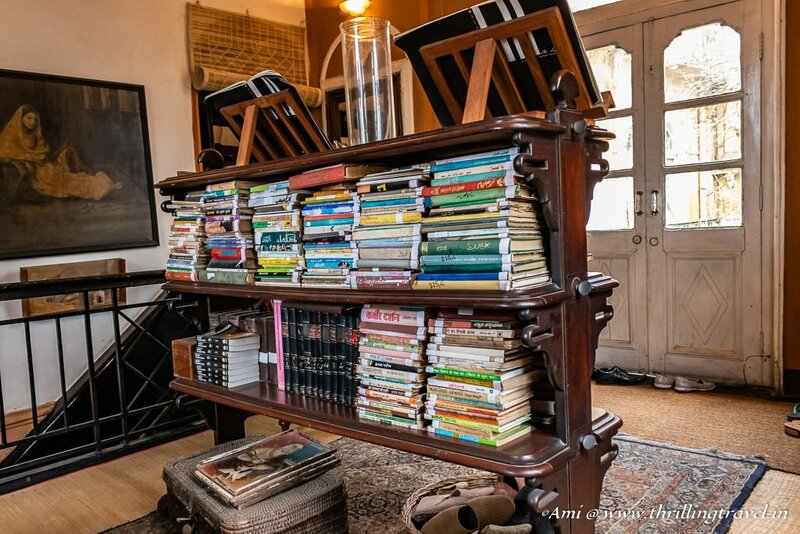 From its quaint library to its curated artifacts, there is just enough to appreciate and understand. Take, for example, this Urdu typewriter – the only one that the company – Remington ever made. Or the quaint old photo frames with memories of the then Prince completing his studies in Britain. I could quite picture the royal family with their help sitting around the long dinning table in the mansion. I particularly found the bedroom quite interesting with its split level layout. They always had a separate section for the men and women even back then. 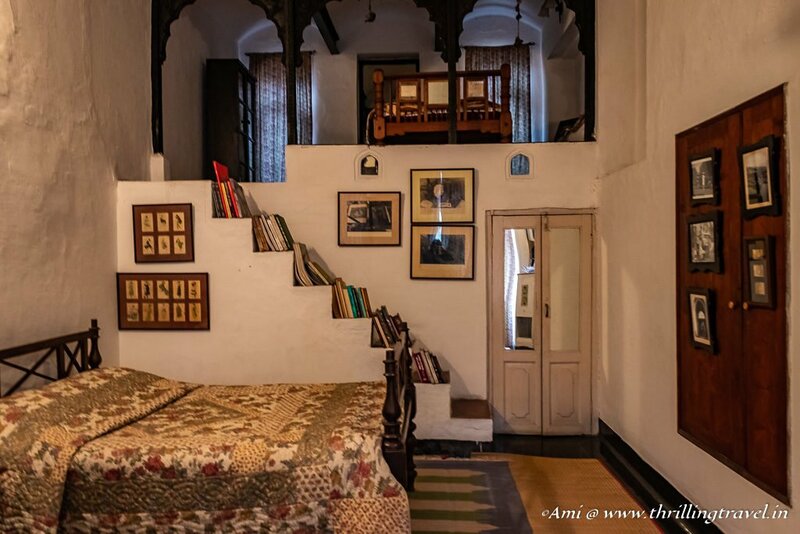 The lower floors of the Kotwara house are used for various cottage industry set-ups. The famous Lucknow Zardosi work is one of those things that can be seen here. More on that in a separate post though. It had been over 2 and half hours since we started the trail through the fallen Kaiserbagh. Picking up those jigsaw pieces to re-create the Lucknow Era of the last Nawab was quite an exciting experience. It definitely seemed that we had lost quite a legacy. I am only glad that I at least, found some missing pieces instead of just none! 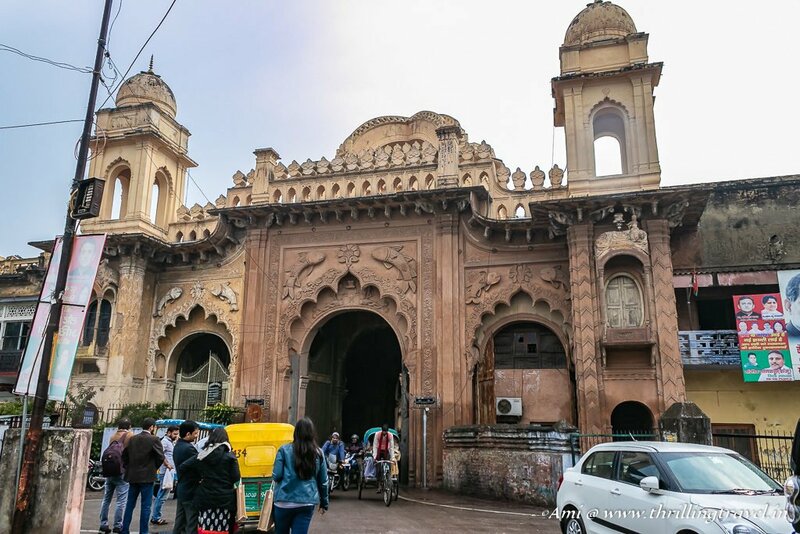 I hope that you too, can take on this challenge of picking up the lost gems of Kaiserbagh – one of the must-do Lucknow Sightseeing Attractions. How to get to Lucknow? You can fly in directly to Lucknow from not just any city in India but also, a few international destinations. There are plenty of flights to Lucknow on a daily basis. Lucknow is well connected by rail and road. Once you are in Lucknow, you can reach the UP Press Club by hiring a taxi or an auto rickshaw. 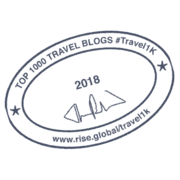 Click this to get the exact location of this place on your mobile map. 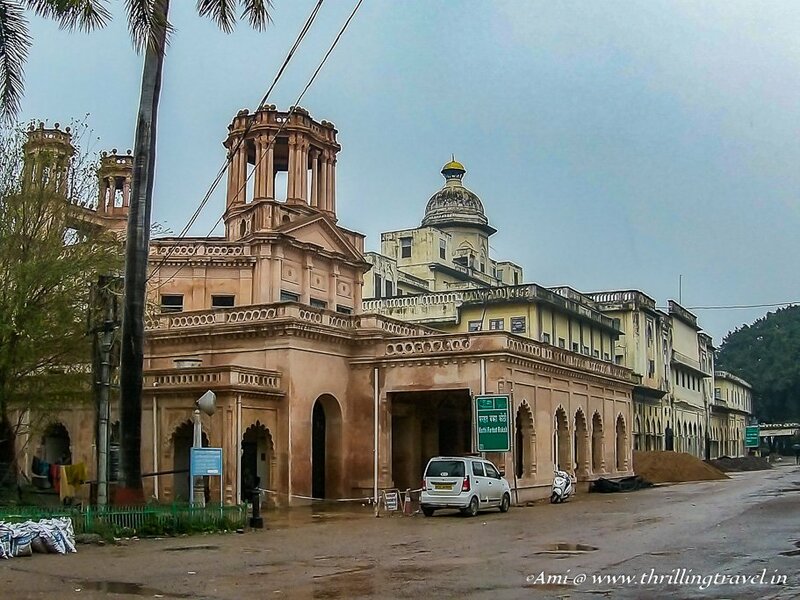 Where to stay in Lucknow? Being a key city, there is no dearth of accommodation options in Lucknow. 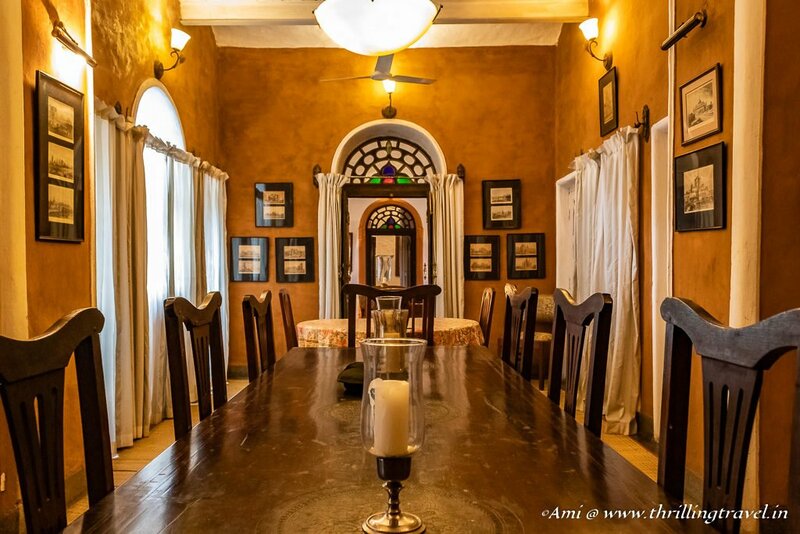 You will find plenty of options for these Lucknow hotels in any budget that you may have. Gomti Nagar is a good location to stay in as it is quite central to the city. The route that we followed on this heritage trail is the same as what is available on the UP tourism website. You can find the same here. While you can always do the walk on your own, I highly recommend a guide. 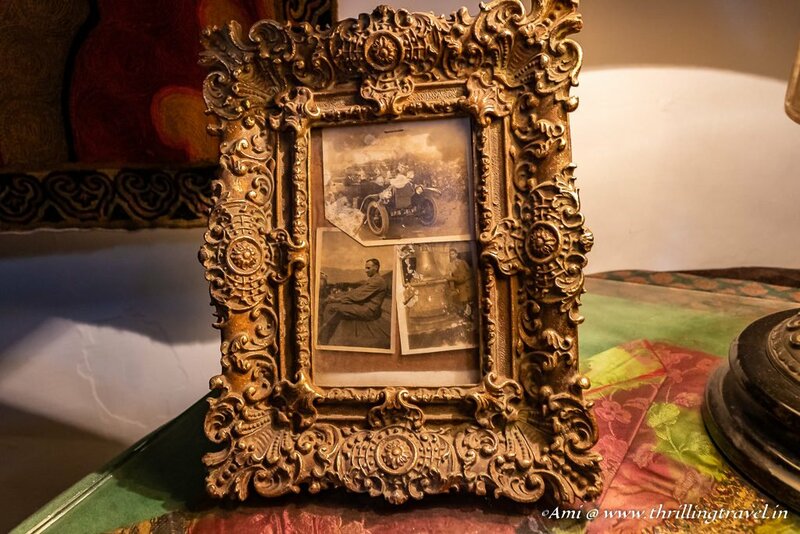 It is not easy to find the hidden relics of Kaiserbagh. There are a few tours organized by the UP Government which you can find on their website. However, I highly recommend the Tornos tour. Not only are the guides knowledgeable, but the entire walk is done very professionally. They even carry images of the past that help you visualize the heritage area better. The area to cover is not much. At most, it would be 2 -3 km. Keep plenty of water with you. There are no entrance fees to any of the places mentioned above. Disclaimer: This article includes affiliate links. This means that at no cost to you, I will receive a small commission if you purchase through my link. Thank you for supporting me with this. Popularly referred to as a Restless Ball of Energy. My Mom refuses to entertain my complaints about my equally restless daughter & assures my husband that I was born with a travel bug. I am a Post-Graduate in Marketing by qualification and a travel blogger by passion. Besides travel, I enjoy photography and if you don’t find me at my desk, I would be out playing badminton or swimming or just running. I believe in planning for every long weekend through the year. And when I cannot travel physically, I travel virtually through this travel blog. 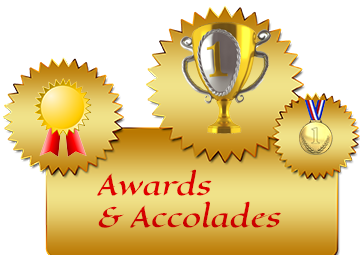 My travel stories have also, got published on various websites and magazines including Lonely Planet India and Jetwings. I have never been on this part of the country and didn’t know it hides heritage like that. Architecture looks stunning and precious. Your post is full of practical information so helpful to organise trip to Lucknow as well as stay over there. This is easily doable from Agra. It takes around 4 – 5 hours by road from there. And then, there is far more to see than what Agra has. So you should plan to get here if you are visiting the Taj. This place looks like it oozes with history and charm. Wow! This looks super beautiful. Lucknow has so much history too it. I’ve never visited, I must now. So much rich culture! Oh yes, there is so much to see here. Hope you can get there soon. I have visited Lucknow in the past as my mausi and her family live there. But I didn’t know about the Kaiserbagh Palace, which looks really striking. The stained glass of the gate is so beautiful! It’s a shame how much has been lost, but at least the historical drawings and photos give an impression. It is nice to see so much preserved. Seeing the images of the old grounds and gates along side the current views really paints the story of the past. The stained glass and stone details add to the rich history. 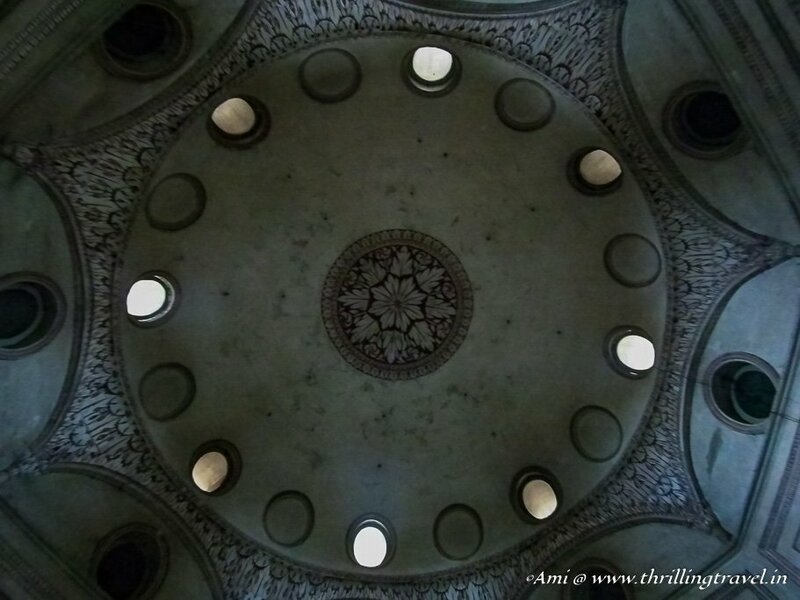 I was certainly wowed by the minarets and domes on the tombs – very impressive architecture. 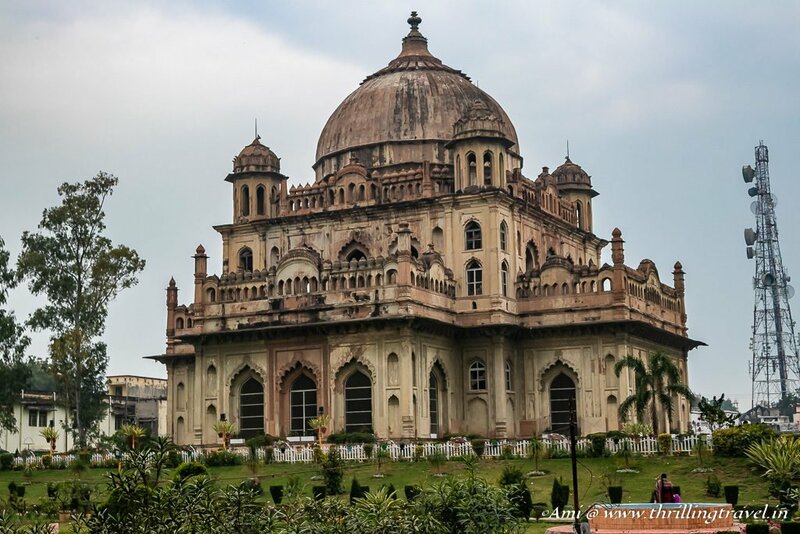 I haven’t visited Lucknow but I will plan it for the future and a visit to the Kaiserbagh is certainly on my list of things to do. I am glad you showed a photo of the layout of the Kaiserbagh it helps to understand the size of the Palace and the rooms etc. Such beauty. 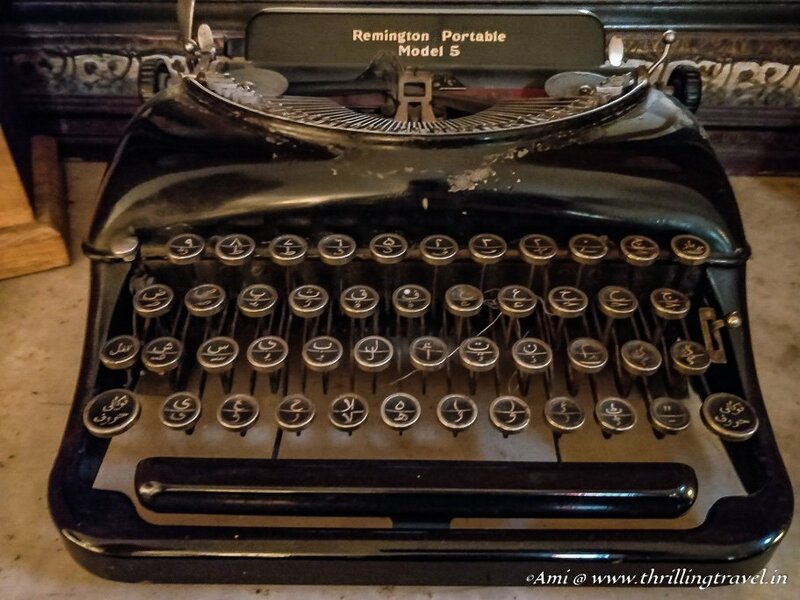 The Remington 5 typewriter – I have a feeling I have used one of them. 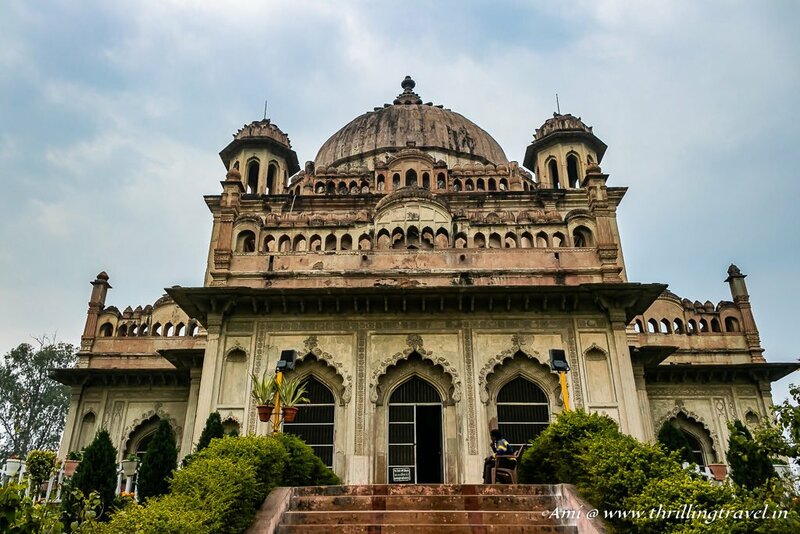 I love Lucknow for two reasons – food and heritage walks. You sold me on doing this next time. Glad to know that the walk is listed on the official tourism board website. Makes it so easy to follow. However, I would follow your advice and definitely hire a guide. These are good to know facts. I haven’t been to Kaiserbagh but now, I am interested after learning more about its history and culture. The details of the infrastructure are amazing. Would be so happy to have an opportunity to see them up close. Looks like a wonderful place to visit. There is so much to explore . !! Loved the pictures . Thanks for posting . Lucknow indeed has so much to offer. Somehow I haven’t taken much time to explore this part of India. I really should. Very recently I was discussing with someone about the loots of British in India. See, here’s one more thing that I didn’t know of! Too bad, they destroyed the fort! It’s is necessary to at least see what’s left of it!